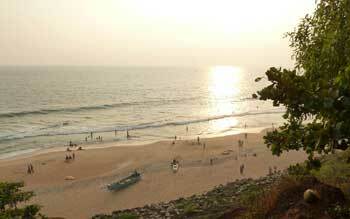 The Papanasham Beach is also called as the Varkala beach and is located at Varkala, Kerala. It lies along the Arabian Sea and part of the Indian Ocean. Papanasham means washing away one’s sins. It is believed that a dip in the waters of this beach washes away all of a person’s sins. The papanasham beach is the only beach in Kerala where cliffs can be found and these cliffs are a geological monument. The beach is popular for swimming activities, sunbathing and it also offers a striking sunset lookout. The beach has many mineral springs, spas and Ayurvedic centers that offer the best Ayurveda treatments. Beach lovers and honeymooners spend a lot of time at this place because of the beauty clad with the cliffs which the beach has to offer. The beach offers the best experience during the months of October to March. Janardhana Swami temple, Sivagiri Mutt, Sivagiri Tunnel and Anchengo Fort. By Air : The nearest airport is the Trivandrum International airport which is at a distance of 51 kilometers. By Train : The Varkala railway station is the nearest railway station which is 3 kilometers from the Beach. By Road : Vrakala is best connected with all other major cities and towns by road. Taxi services are also available from there.